GarageBand delivers the goods on mobile and desktop with surprising power and style. Give it another try. Packed with features. Great price. GarageBand has always had a difficult time with music makers. 'Not powerful', 'Too basic', 'For beginners'... But coming to this latest version for the first time in years we discovered a DAW that delivers the most powerful features around in a deceptively simple way. GarageBand opens with a simple set of templates for making popular tunes. If you're the kind of songwriter or composer who just wants to get notes into a DAW with a great set of sounds, quantise with a click, and for everything to sound great in minutes, then GarageBand is the DAW you're looking for. Everything flows and there's zero time searching for features (changing synths, adjusting velocity, trimming note lengths) as it's all just 'there'. 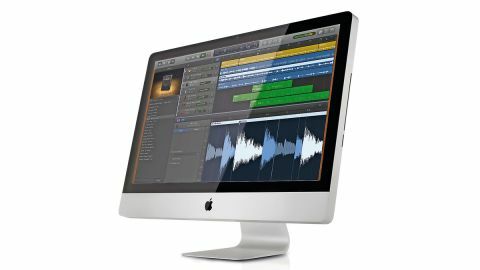 As long-time Logic users, GarageBand has really opened our eyes as to how much we actually need those 'powerful' features. No lie. It's a popular misconception that you can't use plug-ins in GarageBand but a couple of clicks reveals the familiar Logic-style AU tree letting you jack with any of your synths and effects. Smart Controls even does a great job mapping knobs to commonly used parameters. Quantising regions, building tracks in the arrange window, recording, editing... there's even super easy-to-use automation (of the most granular parameters) that positively flies in use. Sure, 'pro features' are missing but time and time again we found that what we actually needed was right there, up front and obvious. On iOS, GarageBand has had a serious kick in the useful pants with the addition of Live Loops. There's still the 'fun' 'intro' Smart Instruments (strum a guitar that's always in tune) and a Tracks view akin to the desktop, but Live Loops is like a whole new DAW in itself. Instruments are replaced by Style buttons (EDM, Hip Hop, Dubstep etc) and the arrange view is replaced by a clip launcher akin to Ableton Live with an APC controller attached. Hit a region and it plays. Loops, in fact. Press another and it does the same, in sync with the first. Press again to silence. Everything you do sounds great and it's possible to turn in an amazing-sounding 'hot knobs' DJ performance with zero effort or practice. Of course, the feature only really comes alive when you start adding your own loops alongside the (superbly recorded, highly-numerous) presets but that's easy enough. Loaded up, you could conceivably run an entire Ableton-style set with just your iPad. Or phone for that matter - but the extra room on the iPad Pro really comes into its own and the audio quality of the output can't be faulted. If you're an iOS fan then there's no reason not to make GarageBand your next favourite app and, if only for fun, we strongly suggest you give Mac GarageBand another spin. You might not go back.